he Three Bays Watershed and Marstons Mills River corridor is located in BArnstable, Sandwich and Mashpee on Cape Cod, Massachusetts. The watershed is part of three separate villages within the Town of Barnstable: Cotuit, Marstons Mills and Osterville. The Three Bays Watershed is comprised of Cotuit Bay, North Bay and West Bay. The watershed is an iconic Cape Cod landscape with unique ecological, historical, recreational and cultural resources. The watershed is situated in a complex landscape matrix that includes a mix of residential and commercial development, as well as a mix of ecological communities including: dunes, salt and freshwater marshes, shrub and forested swamps, cranberry bogs, coastal grasslands and Oak and Pitch Pine forests. Presently, the water quality of the Three Bays is seriously impaired and routinely exceeds water quality standards for nitrogen. In 2016, a summer algal bloom occurred within the Three Bays, which caused fish kills and put the commercial oyster industry at risk. The ecological and cultural impacts brought increased public awareness to the developing water quality issue within the Three Bays. The causes of this water quality impairment include septic system leaching, stormwater discharge and runoff from adjacent lands. This studio looked holistically at a study area within the Three Bays Watershed - centered on the Marstons Mills River, the primary tributary of the Three Bays. This is an important river corridor as it runs through the complex matrix of the Cape and feeds directly into the Three Bays. The studio’s holistic approach assessed: current and future development trends; the configuration and connectivity of protected landscapes along the Marstons Mills River corridor; cultural and recreational resources, with a special focus on water quality and possible landscape solutions to address this issue. The studio was given “priority sites” along the Marstons Mills River corridor in order to design pilot/demonstration site-scale interventions in the watershed to address several key issues: water quality, stormwater management, habitat connectivity and recreational trails and access. 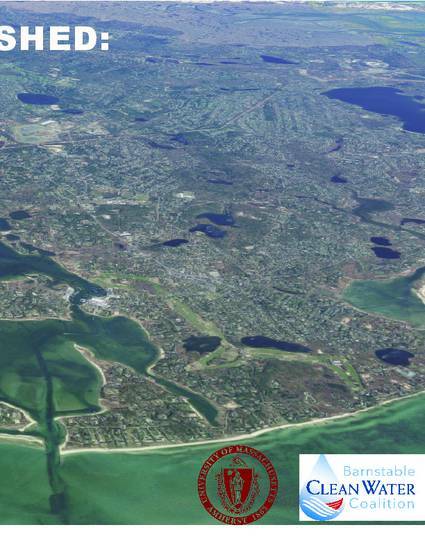 The Town of Barnstable, The Horsley Witten Group, the Barnstable Clean Water Coalition and the Association to Preserve Cape Cod (APCC) have received funding from the US Environmental Protection Agency for coastal watershed restoration in the Three Bays Watershed titled “Cleaning up the Bays”. The Studio collaborated with the Barnstable Clean Water Coalition (BCWC) and other key stakeholders, to perform assessments and field studies. The results of the studio, summarized in this report, provide stakeholders with watershed and site-specific pilot/demonstration projects, recommendations and conceptual designs, which address and provide landscape solutions for surmounting water quality issues that face the Three Bays Watershed specifically and for Cape Cod in general. LA 609 Studio and J. Ahern. 2017. Three Bays Watershed: landscape based solutions for water quality. University of Massachusetts, Dept of Landscape Architecture and Regional Planning.